During your Main Phase: You can target 1 “Photon” or “Galaxy” monster you control; equip this monster from your hand or field to that target. It gains 500 ATK, also it cannot be destroyed by battle. You can send this Equip Card to the GY; add 1 “Photon” or “Galaxy” monster from your Deck to your hand, except “Photon Orbital”. You can only use this effect of “Photon Orbital” once per turn. Photon Orbital can attach itself to a Photon or Galaxy monster during a Main Phase of yours like an ABC piece would. From the hand or field is good, you get another card on field without having to commit another Normal Summon. Protection against battle and 500ATK can make a boss Galaxy or Photon monster even tougher to take down with that new level of protection. Deck thinning search ability once you send Orbital to the grave off an attached monster is good, gives you a way of getting through your deck other than your Spells. It makes sense to have Photon Orbital be only 500ATK and have these powers. You have a strong DEF of 2000, but you mainly use this card to attach, get the search, then send it off to the grave, or attach for protection. 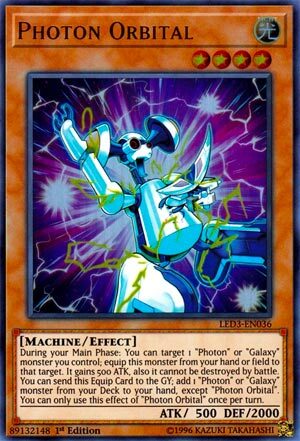 Galaxy and Photon can make big Xyz monsters in a flash first turn, and if you can equip this guy to them it may be even harder to get them off the field. Space can be limited in a Galaxy/Photon Deck, but I think this guy should be considered. Maybe run two depending on the tech that is run. Not a lot of machines in Photons or Galaxies, but this is still a good card. Photon Orbital is a Level 4 Light Machine-type monster with 500 Atk and 2000 Def. From the hand or field you can equip Photon Orbital to any Photon or Galaxy monster to give it 500 Atk and protection from battle destruction. Then, you can send it from equipment to the grave to search any other Photon or Orbital card from your deck once per turn. No downsides to running this card in multiples in my opinion. It’s free and useful during all phases of play. The only downside is that Photon Orbital needs another card to get going and is just a defender on its own. Not perfect but worth running a searcher that searches. Back to the Photon support, and this time with Photon Orbital. Orbital is a Level 4 LIGHT Machine with 500 ATK and 2000 DEF. The ATK isn’t killing much really, but the DEF is nice on a Level 4, Machine is good but not too useful for Photon/Galaxy as a whole unless it is Level 5 to work with Galaxy Solider, while being LIGHT is standard and good for Photon/Galaxy. During your Main Phase, you can target a Photon or Galaxy monster you control and equip this card to it and said monster equipped will gain 500 ATK and will have battle protection. The ATK boost can make a difference since most of the monsters in the archetype have 2000 or more ATK and 2500 is more threatening than 2000 as 3000 is more threatening than 2500, plus not being able to be destroyed in battle is useful from time to time. While this card is equipped to a monster, you can send this equipped card to the GY to add 1 Photon or Galaxy monster from your deck to your hand and this is a hard once per turn effect for Photon Orbital. Another searcher in the archetype is amazing and this one won’t take up your Normal Summon like Galaxy Wizard, unless you summoned Wizard off Accellight. Searching capabilities is important for any deck and Photon/Galaxy has plentiful searching options and this just adds to that. Photon Orbital is an amazing card for the archetype and worthy of being a three of searcher that is searchable. Art: 4.5/5 I see Kite was experimenting on Orbital 7, and some great improvements were made. Orbital 7 received an upgrade, no? Light, Level 4, Machine, paltry 500 attack (especially for Level 4) but we applaud the 2000 defense. So by targeting a Galaxy or Photon Monster you control, you can equip this card to it (from your Hand OR Field, we like versatility) for a modest 500 attack boost, but immunity to destruction from Battle, which we appreciate. While equipped, it can be sent to the Graveyard to add a Galaxy or Photon Monster from your Deck to your Hand. Except itself, of course, and said effect is once per turn. What’s not to like here. Even with the defense, you probably aren’t using this card just for a defense anyway, being such a combo oriented card. The fact is works and searches both Photon and Galaxy (which don’t have to be played together) is beautiful, as well as the secondary effects as mentioned. I’d use two, maybe even three. We like our searchers, after all. Art: 4/5 Definitely more photon looking than the original, I guess all the white does that. All that gold though makes me think maybe a short circuit or malfunction has happened?